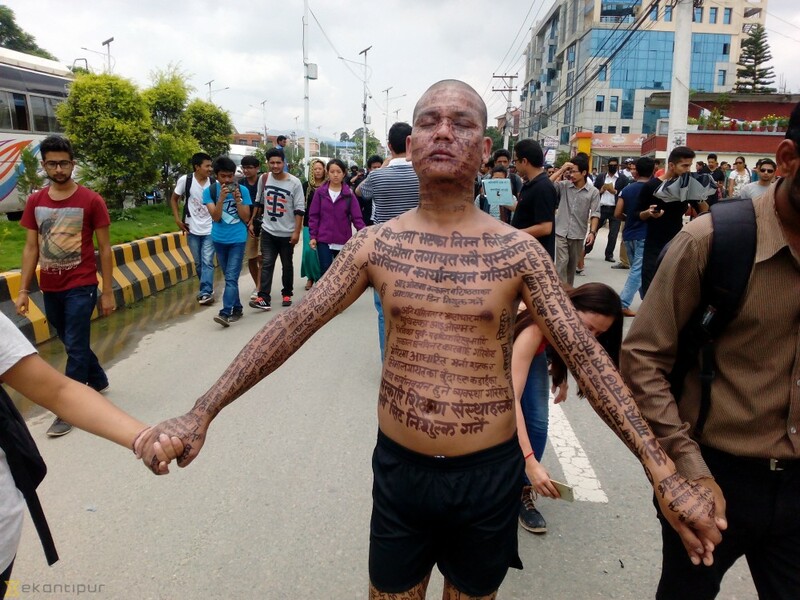 Kathmandu, July 23: A rally was held in the capital Saturday in support of Dr Govinda KC, who has been on a fast-onto-death since the past 14 days, demanding reforms in the medical education and health sectors. People from different walks of life including health professionals, students, artists and commoners joined the event. The demonstrators were seen with placards and banners urging the government to address his demands immediately. The 59- year-old senior orthopedic surgeon is sitting on a hunger strike for the eight time in the Maharajgunj-based Tribhuvan University Teaching Hospital, demanding the enforcement of the Mathema Committee's Report on Health Professional Education Policy, free enrollment in all the government medical colleges, at least one medical college in one ( proposed) province, no license to medical /dental/ nursing college in the Kathmandu Valley at least for the next 10 years and no renewal of those colleges that already got letter of intention. This year, new demands were put forth by Dr KC including the maximum tuition fees for medical education and the number of seats should be as fixed by the Education Ministry , TU and the Medical Council, and impeachment against Chief of Commission for the Investigation of Abuse of Authority ( CIAA ) Lokman Singh Kari . It may be noted that the government has formed a three-member talks team headed by the Health Ministry's Secretary to respond to Dr KC's demands. Though both parties have already met for three times, consensus was not possible yet.